James Harden Illustrated is a personal project by Filip Peraić with a simple goal — drawing James Harden again and again. I got to portrait number thirty! Summer is Coming is an ice cream-themed portrait of James Harden. Astronomers have taken the first ever image of a black hole, which is located in a distant galaxy. Sorta looks like James Harden? Another big feature: CNN did a 2 minute feature about the James Harden Illustrated project. Portrait number 28 is an ode to the greatest sound there is — SWISH. James Harden Illustrated got a full page treatment in iconic Sunday edition of The New York Times. From March 28th, coming back with a bang. Expect very weird artworks every Thursday. Newest addition to shop — beautiful limited edition tee of One Line portrait. Awesome footage of a fan getting James Harden in One Line tattoo. New portrait is inspired by legendary Bob Dylan poster created by Milton Glaser. I'm proud and happy to share that my illustrations from James Harden Illustrated project got a full page treatment in recent Forbes magazine! Six James Harden prints took part in exhibition Athletic/Aesthetic, held in Los Angeles in December of 2016. See photos! James Harden and Houston Rockets said thank you with signed jersey from James Harden! Guide to Space: Earth is not round, it’s James Harden-shaped. Portrait #24 is here. 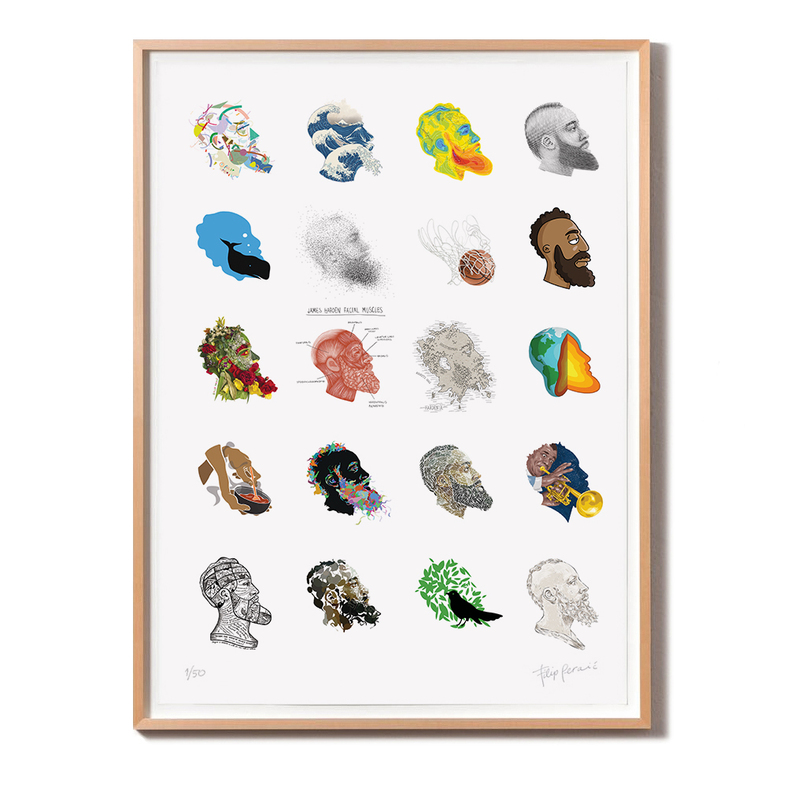 Purchase limited edition prints, signed and numbered by the artist. Tees are made from soft 100% organic cotton, created without using pesticides and harmful pollutants. James Harden Illustrated news and updates delivered to your inbox.